Android 8.0 (API level 26) introduced color management support for additional color spaces besides standard RGB (sRGB) for rendering graphics on devices with compatible displays. With this support, your app can render bitmaps with embedded wide color profiles loaded from PNG, JPEG, and WebP files via Java or native code. Apps using OpenGL or Vulkan can directly output wide color gamut content (using Display P3 and scRGB). This capability is useful for creating apps that involve high fidelity color reproduction, such as image and video editing apps. Wide color profiles are ICC profiles, such as Adobe RGB, Pro Photo RGB, and DCI-P3, that are capable of representing a wider range of colors than sRGB. Screens supporting wide color profiles can display images with deeper primary colors (reds, greens, and blues) as well as richer secondary colors (such as magentas, cyans, and yellows). On Android devices running Android 8.0 (API level 26) or higher that support it, your app can enable the wide color gamut color mode for an activity whereby the system recognizes and correctly process bitmap images with embedded wide color profiles. The ColorSpace.Named class enumerates a partial list of commonly used color spaces that Android supports. Note: When wide color gamut mode is enabled, the activity's window uses more memory and GPU processing for screen composition. Before enabling wide color gamut mode, you should carefully consider if the activity truly benefits from it. For example, an activity that displays photos in fullscreen is a good candidate for wide color gamut mode, but an activity that shows small thumbnails is not. Use the colorMode attribute to request the activity to be displayed in wide color gamut mode on compatible devices. In wide color gamut mode, a window can render outside of the sRGB gamut to display more vibrant colors. If the device does not support wide color gamut rendering, this attribute has no effect. If your app needs to determine whether a given display is wide color gamut capable, call the isWideColorGamut() method. You app can also call isScreenWideColorGamut(), which returns true only if the display is wide color gamut capable and the device supports wide color gamut color rendering. A display might be wide color gamut capable but not color-managed, in which case, the system will not grant an app the wide color gamut mode. When a display is not color-managed —as was the case for all versions of Android prior to 8.0—the system remaps the colors drawn by the app to the display's gamut. To enable the wide color gamut in your activity, set the colorMode attribute to wideColorGamut in your AndroidManifest.xml file. You need to do this for each activity for which you want to enable wide color mode. You can also set the color mode programmatically in your activity by calling the setColorMode(int) method and passing in COLOR_MODE_WIDE_COLOR_GAMUT. To render wide color gamut content, your app must load a wide color bitmap, that is a bitmap with a color profile containing a color space wider than sRGB. 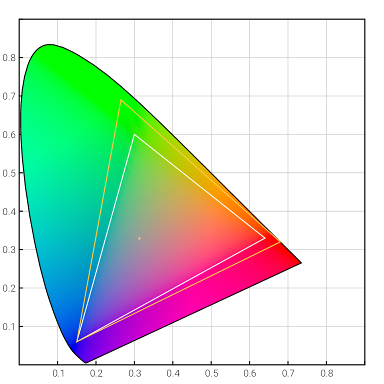 Common wide color profiles include Adobe RGB, DCI-P3 and Display P3. Your app can query the color space of a bitmap, by calling getColorSpace(). To determine if the system recognizes a specific color space to be wide gamut, you can call the isWideGamut() method. The Color class allows you to represent a color with four components packed into a 64-bit long value, instead of the most common representation that uses an integer value. Using long values, you can define colors with more precision than integer values. If you need to create or encode a color as a long value, use one of the pack() methods in the Color class. You can verify whether your app properly requested the wide color gamut mode, by checking that the getColorMode() method returns COLOR_MODE_WIDE_COLOR_GAMUT (this method does not indicate, however, whether the wide color gamut mode was actually granted). This section describes how to enable wide color gamut mode with the OpenGL and Vulkan APIs if your app uses native code. The Vulkan support for wide color gamut is provided through the VK_EXT_swapchain_colorspace extension. Before enabling wide color support in your Vulkan code, first check that the extension is supported via vkEnumerateInstanceExtensionProperties. If the extension is available, you must enable it during vkCreateInstance before creating any swapchain images that use the additional color spaces defined by the extension. Before creating the swapchain, you need choose your desired color space, then loop through the available physical device surfaces and choose a valid color format for that color space.